In 2011, the National Round Table on the Environment and the Economy (NRT) published Charting a Course: Sustainable Water Use by Canada’s Natural Resource Sectors, which provided 18 recommendations for improving water management and governance.1 The report discusses and explores water forecasts, water-quantity data and information, policy instruments with an emphasis on water pricing, and collaborative water governance. It concluded that for Canada to ensure the sustainability of its water supply — which is crucial to the prosperity of its industries in the natural resource sectors — governments at all levels need to engage in collaborative models of governance, develop and publish a regularly updated national Water Outlook, and further explore the use of water pricing for the natural resource sectors to encourage conservation. All levels of government in Canada share responsibility for water management and governance. As the major users of water, the natural resource sectors have a significant stake in water management as well. Many efforts are underway in different regions of Canada to improve water strategies, regulations and policies, and collaborative approaches. The recommendations set out in Charting a Course provide information and advice to help provinces, territories, and federal departments improve policy approaches and achieve their respective water management objectives. 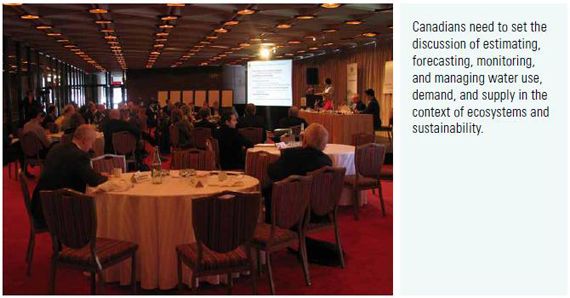 In January 2012, the NRT convened a multi-stakeholder meeting with 50 Canadian water experts, government representatives, academics, and industry representatives.2 Participants from across the county discussed, deliberated, and ranked the recommendations in Charting a Course, suggesting ways to move the recommendations from argument to action. In this report, the NRT summarizes these discussions, identifies key points, and brings forward what forum participants thought was most important. We report on how the recommendations can be strengthened and provide the top priority recommendations as identified by this national group of water experts. Participants went on to identify organizations or groups that might be able to lead or contribute to moving the recommendations forward. This report demonstrates that there is significant momentum to act on the NRT’s recommendations and sets out suggestions for what can be acted upon now. See Appendix I for full listing of recommendations. See Appendix II for the list of participants.